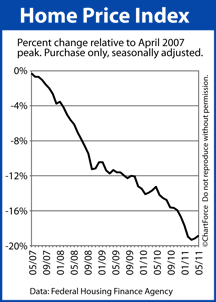 A strong spring season helped home values recover, says the government. According to the Federal Home Finance Agency’s Home Price Index, home prices rose a seasonally-adjusted 0.4 percent from April to May. It’s the HPI’s second straight increase, and puts the monthly index at its highest point since January 2011. As a home seller in Franklin , you may appreciate news such as “rising home prices”, but it’s important to remember that the Home Price Index has a several built-in flaws — the biggest of which its age. Today, the calendar nearly reads August, yet, we’re still discussing May’s housing data. A 2-month delay does little to help buyers and sellers wanting to know the “right now” of housing. Unfortunately, the Home Price Index data is even more aged than that. Because the FHFA’s Home Price Index measures home prices as recorded at closing, the actual sales prices included in the index are from real estate contracts written 30-60 days prior. In other words, when we look at the Home Price Index report for May, what we’re really seeing is a snapshot of the housing market as it existed in March. March’s housing market has little to do with the forces driving home prices today. Today’s real estate market is driven by today’s economics. The Home Price Index is a useful gauge for economists and law-makers; it shows long-term national trends in the housing market which can be used to allocate resources to a project, or to form new policy. For home buyers across the state of Tennessee , though, it’s less helpful. For today’s real estate buyers and sellers, there’s no substitute for real-time data. For that, talk to a real estate professional.